With my love for JCrew, it is hard not to fall in love with its contemporary sister brand Madewell. Whose it better to represent Madewell other than Solange Knowles whose quirky and eclectic style has been gaining so much love in the blogsphere and social media in general. Watching this video affirms that fall is right around the corner. And if you are like me, it is not too early to start stocking up on your favorite sweaters and coats. 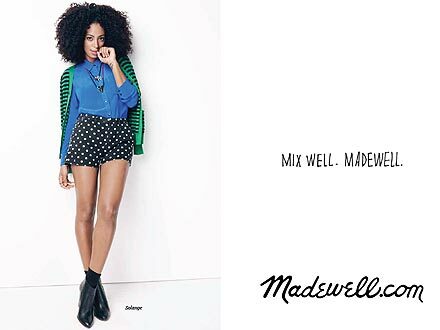 Being aware of Solange's style and with Madewell's fall slogan as "Mix Well. Madewell", Solange Knowles seems to be the perfect face for the brand's fall ads and catalogue cover. I'm so ready for the Fall. Like, yesterday. Solange looks fantastic! So happy that she's evolved into this great person with a great sense of her own style. Love this look! I have almost all of the pieces to make an "Inspired" look! She's so talented and absolutely adore her fashion. i could watch that video over and over!!! Solange looks fab! I don't see that much difference between Madewell and JCrew if I am honest ;-) And no, not ready for Fall yet!! wow , you look fabulous. pretty video. Fun video. It's cool to see Solange mature as her own person and not just in Beyonce's shadow. Also, just have to say that I love your style. Some great outfit posts overall. I really like how she wore her hats!